I updated my approach to how I do this, where instead of doing it all after the chapter, I create a document where I add to it as the chapter progresses. For this reason, I got all this. I know Alric already did Tur'geis and Die'tra so it's optional to include what I did for them in the wiki. Hopefully I got my formatting right. He later leads a squad consisting of Ariel, Faen, Kau, Shala, Sarnel, Chiri, Shan, Ash’arion, Riz’riia, Zan’nah and Die’tra on the surface. He tells Ariel to not overdo herself until her body acclimates to surface conditions. After investigating some burnt farmland, the squad arrives in Ys where they are greeted by Nuru’lara. Nuru’lara tells them about the local conditions and state of affairs and then takes the squad to a tavern. When Die'tra took Riz'riia clothes shopping, he told the shopkeeper that he'd pay for everything. At the tavern, the bartenders tell him to watch out for trouble from near Dari’yako. Later, he and Die’tra accidentally interrupted Ariel’s and Faen’s moment in their search for an empty room. When Nuru'lara announced the call to arms after several fires were started in the colony, he was in bed with Die'tra. He immediately got out of bed to get ready. Outside, he orders Ariel to get to higher ground so she can see what’s going on and Ariel tells him that there are three people chasing someone down a street. He orders her to stay up there and send up flares if she sees another outbreak. He tells the group that they are going to chase the pyro Ariel spotted. They later arrive to save Ariel, Faen and Chiri with Tur’geis being impressed with Faen’s actions. Tur’geis comments that despite their reputation, the Hermione group was easily defeated. After Nuru’lara spots the airship and identifies the direction it’s going, he notes that Felde and Mimaneid are in that direction. He later becomes part of a squad consisting of him, Ariel, Faen, Kau, Shala, Sarnel, Chiri, Shan, Riz’riia, Zan’nah and Die’tra and led by Tur’geis on the surface. He and Riz’riia discovered some burnt farmland and told the squad about it. Afterwards, the squad arrives in Ys where they are greeted by Nuru’lara who tells them about the local conditions and state of affairs. Nuru’lara then takes the squad to a tavern. When Ash’arion later sees Zan’nah in her new outfit, he attempts to flirt with her but Zan’nah rejects his advances. When several fires were started in the colony, he was with Zan’nah and they see Shan chasing the perpetrator. When the Hermione fought back, he tries to stop Zan’nah from attacking since she’s drunk but she wouldn’t hear it. Later, the three corner the Hermione before Zan’nah tells the other two about the airship above the colony. She later becomes part of a squad consisting of her, Ariel, Faen, Kau, Shala, Sarnel, Chiri, Shan, Ash’arion, Zan’nah and Die’tra and led by Tur’geis on the surface. She and Ash’arion discovered some burnt farmland and told the squad about it. She identifies a siege engine they found as goblin made. Afterwards, the squad arrives in Ys where they are greeted by Nuru’lara who tells them about the local conditions and state of affairs. Nuru’lara then takes the squad to a tavern. Before she arrived at the tavern though, Die'tra took her clothes shopping so she could look her best for Kai'to. She chose a red and orange outfit that shows of her legs a lot. When she sees Kai’to, they catch up and flirt with each other. They later decide to have some privacy and go to the Sarghress house. When Nuru'lara announces the call to arms, she was in bed with Kai'to. She gets out of bed to answer the call and tells Kai’to to stay put. Later, Sar’nel wonders where she is after they defeated the Hermione group and it turns she is still with Kaito kissing him. 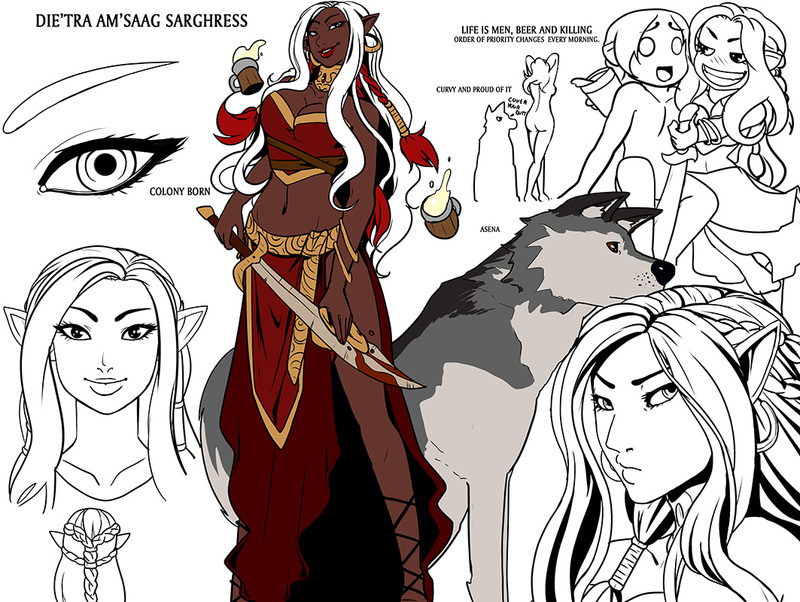 She later becomes part of a squad consisting of her, Ariel, Faen, Kau, Shala, Sarnel, Chiri, Shan, Ash’arion, Riz’riia, and Die’tra led by Tur’geis on the surface. She asks Kau if he misses his golem. After learning of the burnt farmland, she asks Chiri and Shan if they set any colonies on fire recently to which they say they have nothing to do with. Afterwards, the squad arrives in Ys where they are greeted by Nuru’lara who tells them about the local conditions and state of affairs. Nuru’lara then takes the squad to a tavern. When Die’tra took Riz’riia clothes shopping, she tagged along and chose a blue two piece outfit that shows of a lot of her figure. Ash’arion tries flirting with her but Zan’nah rejects his advances and tries to hang out with Nuru’lara. After several fires were started in the colony, she was with Ash’arion and they witness Shan chasing the perpetrator. She wanted to fight as well despite her drunken state and Ash’arion let her after trying to stop her when she decided to use a broken of shoe part as an improvised weapon. After the three cornered the Hermione, she spots an airship above the colony and tells the other two about it. I can't tell what race she is so for now I just put Drowolath. Her skin tone is different from typical drowolaths, probably as a result of her being colony born. She has several braided ponytails which were dyed red while most of her hair is white. Under her armor, she is curvy and proud of it. To her, life is men, beer and killing with the order of priority changing every morning. She joins the squad consisting of Ariel, Faen, Kau, Shala, Sarnel, Chiri, Shan, Ash’arion, Riz’riia, Zan’nah and her and led by Tur’geis on the surface. She makes small talk with Faen, telling her that she dresses like a bear. After investigating some burnt farmland, the squad arrives in Ys where they are greeted by Nuru’lara. Nuru’lara tells them about the local conditions and state of affairs and then takes the squad to a tavern. Before that though, Die'tra took Riz'riia clothes shopping so Riz could look her best for Kai'to. Later, she and Tur’geis accidentally interrupted Ariel’s and Faen’s moment in their search for an empty room. When Nuru'lara announces the call to arms, she was in bed with Tur'geis. She jokingly wonders whether she should go covered only by a blanket. She goes after the pyro spotted by Ariel on Tur’geis’ orders. They later arrive to save Ariel, Faen and Chiri with Die’tra stabbing the Hermione battling Faen. When Ariel regains consciousness, Die’tra tells Ariel about Faen’s courage in trying to keep her safe. "''You’ve experienced nothing yet girl, this is a warm breeze! Up North the cold is so intense the rivers overflow with ice!''" I think she’s the best . After all, she is my cameo . Also, can you update Ari'nara's page to reflect the fact Nuru'lara is her sister? She has long blonde hair which is dyed red at the ends and worn in a ponytail. She has a tattoo of a unicorn wolf on her arm. She wears standard armor and white clothes with a red skirt under the armor. She has an upbeat personality. A former Kyorl’solenurn warden, Nuru’lara got tainted in the line of duty. When this was discovered, she fled from her former comrades and found refuge with the Sarghress. 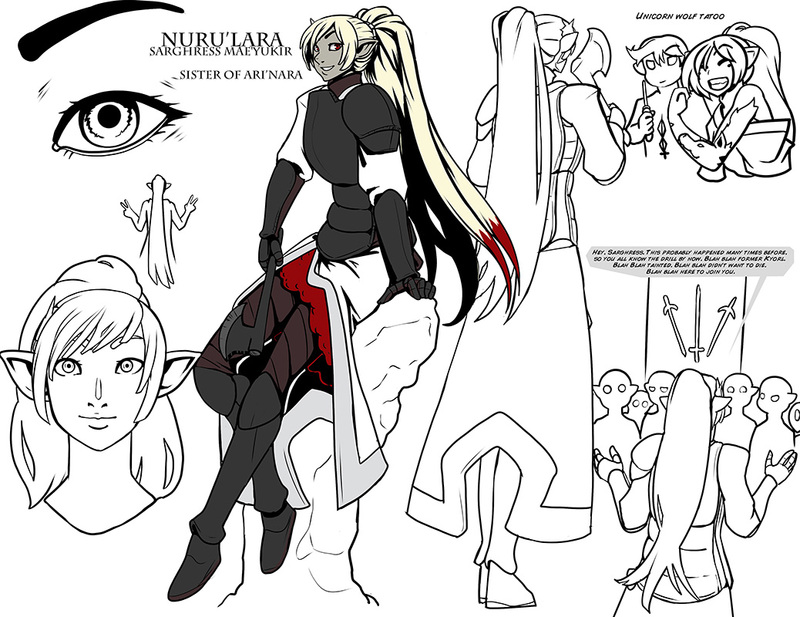 Nuru’lara was assigned to represent the Sarghress in the colony of Ys. She greeted the Sarghress squad who arrived and introduced them to Ys. She told them that they can all take days of since the colony doesn’t like asking for help from the clans, including the Sarghress. Nuru’lara then takes them to a tavern. When Ariel doesn't feel like taking part, Nuru'lara points the way to the Sarghress house. She tells Riz'riia that Kai'to is at the tavern when asked. At the tavern, after Zan’nah rejects Ash’arion’s attempt to flirt with her, Zan’nah asked Nuru’lara if she was doing anything later. After several fires got started within the colony, including one that burned down a house, the colony council decided to turn to the Sarghress for help and Nuru'lara passes the message on to all Sarghress personnel stationed there. When asked, she tells Ariel that Shan and Chiri are already helping. She goes after the pyro spotted by Ariel on Tur’geis’ orders. They later arrive to save Ariel, Faen and Chiri with Nuru’lara being impressed Faen apparently did all that she did. She then identifies the red-haired Hermione as the leader and concludes that the colony must have captured a high-born for the Hermiones to launch a rescue mission to free their people rather than leaving them to be slaves like others were. When the wind picked up, she notes this and sees an airship above the colony and points this out to the others. She identifies the direction it’s going as south-east. "''Ho raiders! Welcome to Ys! The proud independent colony. Beautiful, vast, clean, full of tasty food. And 100% goblin free! Now that we’ve kicked their asses so hard.''" Introducing Ys.